Sights: High profile sculptured rear sight, drift adjustable for windage. Dovetailed front sight blade with horizontal serrations. The Desert Eagle 1911 single action models are available in three barrel lengths: 5.01”, 4.33” (bushingless) and 3.0” (bushingless). They are shipped with two magazines with extended base pads for positive magazine insertion. The frame is precision cast and machined from high quality steel (aluminum, 3.0” model) and the slide is machined from solid billets of steel then finished in a matte black or matte stainless. 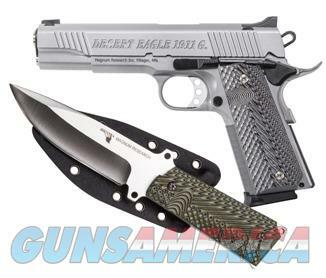 The Desert Eagle 1911 comes loaded with features that would cost extra from a custom gunsmith. Some of these features include high-ride beavertail grip safety, extended magazine release, aluminum trigger with an overtravel stop, stainless steel full-length guide rod, extended thumb safety, enlarged ejection port, beveled magazine well and G10 (black/grey) grips held in place by stainless steel hex screws. Series 70 configuration. Includes KNIFE1911 and Kydex Sheath.